Cleveland City Council President Martin Sweeney released the proposed ward boundaries for 2014. This is just one day before he presents them to be voted on in City Council. City of cleveland issues this map. A JPEG. Not even georeferenced. – it has no street names, all features (including rivers and railroads) are all styled the same. Nothing more. Cleveland’s approach to open data, particularly in this instance, isn’t acceptable. Nor does it help foster a culture where civic hacking flourishes. Great maps and other visualizations including this great slippy map of new Districts of NYC by WNYC (led by jkeefe) that inspired me to do this, shouldn’t be exclusive to the tech cultures that we usually hear (NYC, SF, CHI, Austin, SEA, PDX, on and on) or wherever Code for America stops in for the year. Later that afternoon, Current Ward 14 Councilman Brian Cummins, had received PDF maps of most of the proposed ward and posted them on his blog. A step above from what I had before. A Shapefile would be too much to ask. So I began by opening up a blank layer in JOSM, loaded in the Cleveland boundary from OpenStreetMap (less things to draw that way) and began simply tracing out the boundaries over Openstreetmap tiles. I was switching windows every couple minutes, looking at the JPEG boundary, then drawing the same lines in JOSM, repeat. Had to be a better way, was going to take a couple hours (and it did). Behold: The georeferencing tool in qgis, which would let you load an image as a layer. This, I thought would be a shortcut. I could create the polygons of the wards by tracing right over the boundaries in the image, without hauving to switch windows. The biggest problem was that I didn’t know the projection of the JPEG. Unfortunately, these tutorials assume that your image is georeferenced. To georeference in qgis, you should know what the projection of your original image is in before you start. If you don’t know, you’ll have to do some guessing and trial and error. I made a few guesses of the most popular projections (4326, 3857) and then tried several ohio ones. An hour or 2 later, none of the projections worked out. So, I scrapped that idea, I began to draw the ways again in josm. use osm2pgsql to convert my .osm file of boundaries (which were in the form of relations, specifically multipolygons) to load into a postgis enabled database. Next, I used Mapbox’s (which consists of data from OpenStreetmap) technique to create a custom map that I can use as my reference base layer. Style my layer of proposed ward boundaries in Tilemill…. – Add in the census tracts so when a user hovers over an area, they can see the population of a particular place. – convert the 2014 ward boundaries (currently as a .osm) to a shapefile so others can use it. offering interaction (users seeing the picture when their mouse cursor is over the marking, a nice zooming action when someone clicks on the list of markers). As someone who’s learning, this can be frustrating at times. However, I can understand (and don’t agree) the developer’s prospective: code becomes obsolete relatively quickly (within years), decreasing the incentive to write good documentation. Good documentation also means more than just writing enough notes for yourself so you could understand it months later. I am guilty of this myself sometimes for my projects. Most other online resources have been meh. In a nutshell, Cleveland was missing a place, really, a culture or ecosystem where people could informally talk about OpenStreetMap, open-source geospatial software, and other GIS-related projects [cool maps, data visualizations, analysis, etc] that they are working on. As the culture would develop, people would develop friendships, increase the size of their network, hare tips on using software, discuss geospatial news, share pointers on code, give career advice or share job leads, maybe even off or start ventures or even informal projects together. etc, all things that were missing or didn’t exist as much as they already did. This culture isn’t going to develop overnight. But it’s starting. I’m excited to what will come out of it. One thing about designing maps, you want to draw people to what they see (yes, ultimately the viewer will have their own subjective interpretation, but I digress…). So, when designing a map to highlight the locations of 125 items that were to be photographed in the 2012 CPS Cleveland Photo Scavenger hunt, I wanted to focus on the contest area while giving viewers (likely participants who may have forgotten the exact boundaries or may not have done the scavenger hunt but would be at least familiar with downtown Cleveland) a little context of the surroundings. How to accomplish this ? Well, I’m guessing it can be accomplished through a couple different ways: one, by, fading the surrounding features (this known as the buffalo tint) as shown in this demo by Bill Morris, wboykinm (he does inspiring works using Tilemill, pushes it to its capabilities, and blogs about it who does this buffalo tint over a separate base map, or by laying a gray mask over the surrounding area outside the border, on the same map. Either of these techniques – Decreasing the opacity of the outside area or giving it a gray mask to make it a bit harder to read, drawing the viewer to the easier part to read and having the non-grayed part pop-out. Unfortunately, all of the polygon-comp-op options that I tried including dst-in which had no effect or colored inside of the border. I uad only been able to lay the mask over the rest of the features inside of my polygon, (labels, roads, water, land), but not outside – what I’m intending to do. was called again in base.mss to provide Lake Erie with its blue sheen. I figured that might have something to do with it but that was a red harring. I eliminated that line and it left me with a gray lake. Meanwhile, I hadn’t figured out yet or found anyone else who had done anything like this – overlay a mask over multiple layers except for a specific region in Tilemill. Flash forward 24 hours. This is why I love Tilemill. Yes, it’s free, open-source, supports linux (as well as win and osx). What you see is what you get – allowing you to code on one side while showing what your map looks like on the other. I’ve been a fan for a while, and I’m finally starting to make progress learning its intracies and operations 15 months later as its capabilities increase. It’s getting kudos by cartographers (Dane Springmeyer, lead developer of Tilemill, had the most attended presentation, by far at this year’s NACIS, the biggest annual mapping conference in North America). I was a bit frustrated, and after a day of trying to understand the comp-op and wondering why all of the comp-op operations that I was trying had no visible effect or achieved the opposite of what I was intending to do, coloring inside the polygon, as shown above. Only a few hours after I posted my query in TM support, Dane clarified some new tools that became available in mapnik 2.1 (just released 2 months ago) and how to go about doing it in Tilemill. (for future reference, note: In this code, as opacity gets closer to zero, you are able to see more and more of the area outside of the border. As of now, I didn’t use the gray mask that I first intended to do (nor have I figured it out yet) but I’m really liking the results and I’m encouraged by my progress, to be able to do something that I hadn’t before. Work on this isn’t done (I’d like to customize the colors a little more, maybe add interactivity) and you can follow the progress at its github repo and view the map. a] I don’t want to appear too ignorant to others. Typing this out makes me realize the above thought is pretty sophomoric. We all have to start somewhere when we learn things including postgis, programming, cartography, and other things in the geospatial world. b] Like others, I don’t always want to go back to my notes to write concise documentation. I just write enough to make sense for myself later on. Other tech writers do the same thing when they write documentation… leading to point C [SIDEBAR: I keep a textfile of every each problem, install issue, question that I have, named log-nameofprogram]. What’s the difference between a “super user” in postgres and another user ? Should I use the ‘postgres’ user in my day to day postgis work ? Should my created user be a super user ? All of my mapping work is locally done on this computer. I’m the only user. Occasionally, I’ll make dumps of my db’s and then store them in other places. Until now, I had been just using postgres (the default user name, after you install postgres) as my user name. I knew that you could create a user name, but wasn’t sure whether I should or not in my case. What was the difference anyways ? As a result, whenever I converting data into postgis databases, I would have to copy these data files (usually from OSM) into /tmp because postgres could access files from my /home . I was finding it to be a bit inefficient, and I was prompted to determine whether or not I couldn’t access my python virtual environment (where imposm is installed) while logged in as postgres.. The Postgresql documentation was a bit helpful. What does LOGIN priviledge mean exactly ? Oh, well. A couple paragraphs down, they mention that I can issue CREATE ROLE name CREATEDB. It raises a good point, do I want a password with my postgres user account ? psql -d cleve -c "CREATE EXTENSION postgis;"
ERROR: permission denied to create extension "postgis"
argh ! Why shouldn’t I be a super user if I have to be a super user to create a new database ? What’s the difference between a “super user” in postgres and another user ? Should I use the ‘postgres’ user in my day to day postgis work ? Should my created user be a super user ? Do I want a password with my postgres user account ? 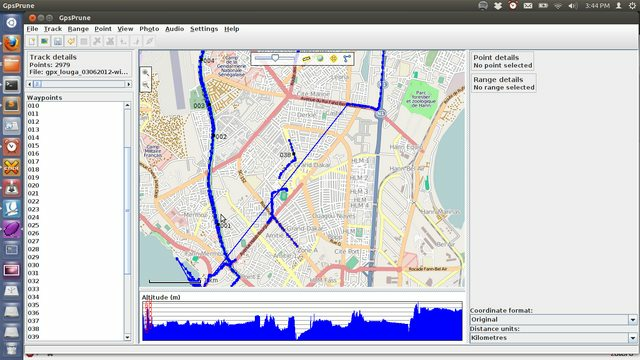 Cleaning up .GPX files for OpenStreetMap and Visualizations. While going through the rest of my GPS traces from the HOT exploratory mission in Senegal [some write-ups on the HOT blog], I had found one GPS trace that has 2 problems that I’ve occassionally experienced while collecting gps traces for OpenStreetMap. and cuts across roads and features. An example: Did I time-travel across that area ? Nope. – And what I call the ‘scribble effect’ (is there another name for it? ), where I accidentally forget to turn off the gps after I arrive at my destination and end up with multiple points near each other, looking like a child scribbled in a coloring book. If you’re planning to make any visualizations with your traces, these two symptoms allow viewers to misinterpret where you’ve been and make your visualizations inaccurate. 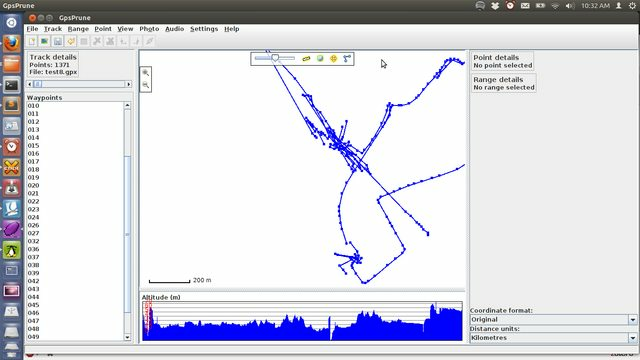 The scribble effect also negatively affects OpenStreetMap because GPS traces that are uploaded in the future in the same area as your scribbled GPS trace, other users will be able to not be discern the newer gps trace from your scribbled gps trace. There’s also still a few places on earth (including some regions of Senegal) that don’t have any satellite imagery to (legally) use for drawing ways for OSM. So, after you complete a trace, how do you eliminate these symptoms described above? but have yet to find a single command that would solve both issues. – this had fixed the temporary signal loss … but it didn’t fix the scribble effect. (resulted in a blank GPX File. – removed 1100 of the trace’s 2400 points and the , but still left me with the scribble effect. I’ll continue to explore cleaning up the GPS traces with GPSbabel filters and hope to find a way but if you know of a specific filter in gpsbabel or any other way to do this, besides manually deleting the offending points in gpsprune, I’d appreciate it. Update: Dec. 1, 2012. I also shared this in an OpenStreetMap Diary Entry in Sept. Other OSM users have also experienced this problem and hadn’t found a solution besides what I’ve described above. So, I’ve found that the test3 example above and manually removing the points in gpsprune (from the scribble effect) is the easiest way to clean up your GPS points. Should I create separate layers for labels and then for the features (roadways, buildings, etc) themselves ? Yes. If you’re intending to display text of any feature (like the name of a building or road), create a separate layer for them. You can name it as ‘labels’ or whatever you’d like. Labels are not yet automatically set to render on top of every other feature (<a href=”https://github.com/mapnik/mapnik/issues/87&gt;) layer so the text will not display as you intend in some instances (Dane Springmayer gave me a much more detailed explanation at State of the Map-US 2012). Should each feature (roadways) have a separate layer ? Do you have different layers for each zoom level ? It’s common practice to have separate layers for highways based on different zoom levels. Wnat data sources should I use ? 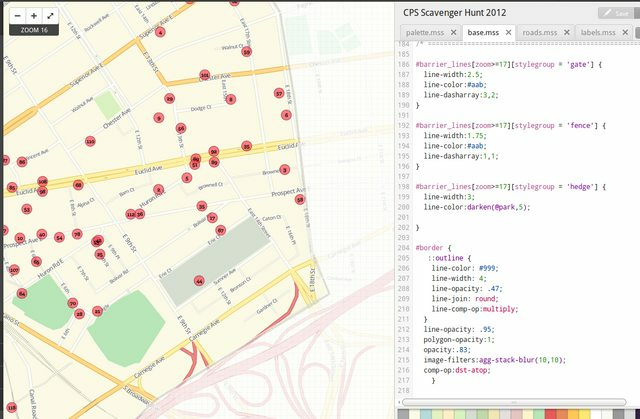 Is there an advantage to use SHPs over PostGIS Databases ? 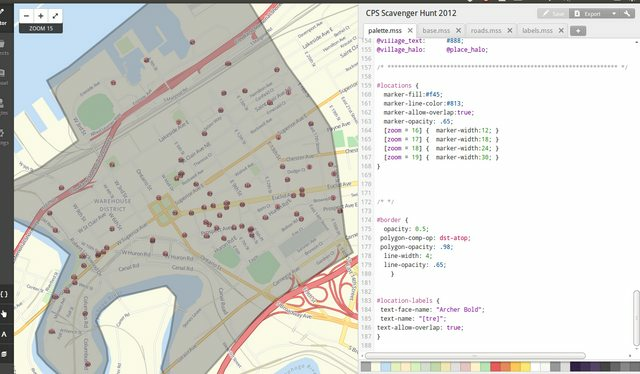 GeoJSON instead of sqlite ? I haven’t found any Tilemill stylesheets that extensively use layers from postgis besides osm-bright and am curious to see what others do. Remember to ask yourself at each particular zoom level, what do I specifically want to show at this zoom level ? Debugging, or why is my code or Tilemill, not working ?! – Normally, Tilemill will point out a specific error in your Carto if it’s not formatted correctly. Osm-bright – Made by Mapbox. Short notice, but I’ll be giving a presentation on using Openstreetmap and my work on Cleveland in OSM Tonight at BW’s ACM’s Chapter meeting if any readers are interested. 7:00 PM, Room 147, Math and Computer Science Building, Baldwin-Wallace College (This Room is in the Mathematics wing).